"Would you like a service plan with that?" When I bought this $7 USB thumb drive at the local Office Depot, the cashier asked me, as he is required to do, if I'd like a service plan to go with that. "How much is the service plan?" "Don't you fell kind of silly asking people if they want a $5 service plan for a $7 USB drive?" "Yes, but we're required to." Suggestion to Office Depot: Allow your employees to use some common sense so as not to embarrass themselves. Sure, give them a quota of service plans to sell, but let them use their judgement. We have a fantastic bagel store in our neighborhood: Brooklyn Bagel and Coffee. When I buy bagels there and take them to an event, people always ask where I got them. Better than most bagels I've tasted in Manhattan. A new entrant in our neighborhood is called Astoria's Finest Bagels. Haven't tried them yet. Already, they are trying to convince the neighborhood that they are about more than bagels. Advice: Pick something, and be great at it. Second advice: Pick a name that reflects what you want to be. Easier than rebranding yourself right after you open. I'm impressed by the entrepreneurial energy and willingness to experiment by some of the local delis in our neighborhood. At this green grocer, the owner has arranged all the fruit and vegetables into a set of terraces to create a wonderful vista as you enter the store. This is new - just a few weeks ago all the fruit here was at the same height. Now when you walk in you are greeted by a veritable cornucopia. It doesn't take much for a child's imagination to start working. Here we built a fort in the woods - just a few dead logs piled together to help get their stories started. Samuel takes notes in his notebook while Alejandra and Grandma rest. Two faces of a clock on 41st St between Seventh and Eighth - photos taken minutes apart. Here is my local library branch - the Steinway branch of the Queens Public Library system. The Queens Public Library system is one of the biggest in the world, and they do a fantastic job. I have many great things to say about them. I stop by and pick up 50 (the limit) books to read to the kids and swap them out every 3 weeks. I'd like to be able to drop the books off at any time, including the evening and on Sunday. But the drop box is only open when the custodian is in the building, usually from 6:30 a.m. to whenever they open. Unfortunately, if it is the custodian's day off, the drop slot is closed, and you could bring an armful of books by in the morning and then have to carry them to work or walk home. I asked one of the librarians why they don't just leave the drop-slot open 24/7. I was told that they've had problems with people dropping all sorts of unfortunate things through the slot, including items on fire, and live animals. She told me that on branch - on Broadway in Queens, has a machine that accepts library materials 24/7. But you need to swipe your card, and then you can put in one item into the slot at a time. They have a plan to install this machine at the Steinway branch. But there isn't enough space in the current configuration. So they plan to switch the handicap ramp to the other door. And inside the building there isn't enough room, so they are going to have to move a wall and expand into the area currently occupied by the local library's director's office. If they don't want to put it on the street in front of the library (there is certainly room on the sidewalk out front), they could put it in the CVS at the end of the block. Good for CVS: more foot traffic. Good for the library. The other day my glasses got squashed and both lenses fell out. The closest optometry place I could find was at a Costco. The technician in the eyeglass shop there repaired my glasses for free. A couple years ago, I had the same experience at a Wal-Mart optometry shop. They repaired my glasses for free there too. In both cases, in lieu of payment they asked for a donation to the Children's Miracle Network. Is there a law that prohibits these shops from charging for repairs? I found it odd that at both stores they did a service for free that I would have been happy to pay for. Also, I found it interesting that at the Costco where I got my glasses fixed, right in the same building, but with a separate entrance, there was an optometrist office, very clearly labelled as independent from the store. Is it illegal for a store to employ an optometrist? Perhaps similar rules that prohibit a physician from working in a place that also retails pharmaceuticals under the same roof? Met two men driving around our neighborhood in a van, scavenging, on the evening before trash day. They told me that what they most preferred to find is metal: brass chandeliers, heavy steel pipes, aluminum. They sell it somewhere along Maspeth Avenue in Brooklyn. On little commuter planes, it can make good sense to be the last one off, unless you just want to stretch your legs. One danger of giving out an annual award and then putting the plaque with their names in a public place is that you'll get out of the habit. It is always a little sad to see management drop the ball like this. Here is the Tower of Dulles award - the plaque is in the passenger terminal. Apparently no one has won the award since 2000. We made a trip out to the beach at Fort Tilden, a beautiful stretch of beach in New York City, practically deserted in May, and built another driftwood fort. Samuel and Alejandra had a half-hour of fun playing with the loop they are holding. Where are the United Airlines and US Airways iPhone apps? Delta, American, and Continental all have iPhone apps where you can check your flight status, check-in to flights, and get a mobile boarding pass. What is the causing the delay at United and US Airways? Was it simply an issue of funding the development of the app? Or is there some kind of turf battle going on inside the organization? Instead of getting your eyes checked at the local optometrist, consider a visit to a College of Optometry. The University Eye Center, on 42nd St between 5th and 6th Ave, run by the SUNY College of Optometry, conducts the most comprehensive eye exams that I've ever had. Students conduct the eye exams, and then their instructor, a fully licensed optometrist, stops by at the end to give your eyes a quick check as well. The exams last about an hour, and cost only $100-120, depending on what extra tests they do. Still buying stamps at the Post Office? Buy them online, instead, at the USPS store. And you can pick any stamp design you want. For bars that pride themselves on their wide selection of beers on tap, I can't understand why they don't offer a beer sampler: get 6 shot glasses with the beer of your choice for, say, $6. Makes it easy to sample their wide selection. Gets people tasting the beer and talking about the beer, and adds an element of fun. To really make this work, you could have coasters for each of the beers on tap that would have a short description of how they are made and with what ingredients. If you have to commit to a whole pint of beer, you're less likely to be adventurous than if you are just paying for a sip. Then if a customer finds a beer that she particularly likes that is on tap at this bar but not at other ones in the area, it builds customer loyalty. They could probably charge more per ounce of beer than if selling it by the pint, balanced by more work washing all those shot glasses. When you receive poor service at a hotel, ask that the hotel to comp some portion of your stay. I've found that often the front desk has limited leeway on comping the daily rate, but they'll often take incidentals off your bill. If they won't do that, then see if they'll give you points as compensation. I found out a few weeks after the fact that a hotel had charged me for an extra night by mistake. This wasn't on my folio when I checked out - I only found it by looking at my credit card bill. When I called the hotel, they reversed the charge and gave me enough points for a free night's stay at that property. Once, at a Westin, they checked me into a room that hadn't yet been cleaned from the last guest - the bed was still unmade. This was a hassle because it was 11 p.m. at night and I had been up since 4 a.m. The front desk put me into a clean room and gave me 5,000 Starwood points - worth about $100 to me. At a Hilton in Hartford, CT, we had a real fire drill - they made the whole hotel evacuate. I emphasized how my two kids had been sleeping and how I had to carry them both down 11 floors of the fire escape. They comped three days of valet parking charges. The worst the hotel can do is say no. I've reorganized this site's list of recommended reading. The list is now in a downloadable MS Word document on its own separate page, and I've added some short notes to indicate why I recommend the book. Instead of ordering a venti and asking the barista to leave room for milk, just order a grande drip in a venti cup. You get the same amount of coffee and save thirty cents. Under the pillow, place the George Washington Presidential $1 coin. Then for each subsequent tooth lost, you can give the next Presidential coin. For $30 on Amazon you can buy a set of the first 14 coins. You'll probably also want to get a collector folder for your child to collect the coins. A way to sneak in a little history lesson. After the financial crisis of 2008, which I'm just guessing was not predicted by either of the authors of this book, and the publication of The Black Swan, the idea that it would be possible to predict the next crisis using a set of 50 economic indicators seems hopelessly naive. Does the book include chapters on divining rods, knuckle bones, and bird flight? Investors know that they should pay attention to well-known economic indicators like inflation and unemployment, but only a smart few look at a broad range of other indicators to see when the next crisis may hit. In THE WALL STREET JOURNAL GUIDE TO THE 50 ECONOMIC INDICATORS THAT REALLY MATTER (Harper Paperbacks; $15.99) Simon Constable, host of The Wall Street Journal's News Hub show, and Dr. Robert Wright, the Nef family chair of political economy at Augustana College in Sioux Falls, SD, provide an entertaining and essential guide to the indicators that you aren't following—but should be if you want to beat the market. "A short, sweet and savvy introduction to economics, indicators and investing." The Vixen: Also known as the hot-waitress indicator, it tracks the attractiveness of wait staff at your local diner to help you judge where the economy is in the business cycle. Big Mac index: If you're looking for currency trading opportunities, you'll want to understand how the value of a Big Mac differs from nation to nation. Fertility rates: This fecund indicator can lead investors into or out of sectors sensitive to a nation's age structure, like education or health care. THE WALL STREET JOURNAL GUIDE TO THE 50 ECONOMIC INDICATORS THAT REALLY MATTER is available wherever books are sold. For more information about this and other books from The Wall Street Journal, please drop me an email at: roseellen.d'angelo@wsj.com. While trying to get into Manhattan recently with the family, there was a big traffic jam on the Triboro bridge, so we decided to try to make the best of the day and explore Randall's Island. We followed the street signs all over the island looking for a promised nature center, but when we couldn't find it, we decided to just take a stroll down by the waterfront. That provided the spark. We found our own piece of driftwood and stuck it in the sandy soil, then we found a few more pieces, then some pipes. We at first thought we might make a crocodile, and then it morphed into an airplane, and then we found a few more boards and it became a one-room house, and then we needed chairs and a bed, and keys, and then we needed to expand to have one room for my son and one room for my daughter. Randall's Island is technically part of the Borough of Manhattan, and this may have been the only driftwood fort built on Manhattan that day. There are about 100 baseball fields on Randall's Island, and all of them had games in progress. At least 2,000 kids playing by a set of rules, monitored and supervised. I was glad to have this serendipitous outdoor experience with the kids. While I did the heavy lifting, it was their imagination that took over. Samuel saw a waterbird floating and called it a sea serpent. A piece of driftwood became a light saber to fend it off. An old iron pipe became a tube that would send him messages of impending danger. Go and build something without a plan. Add a little something to your environment, even if you don't have permission. In New York City, you can now avoid getting flyers from the supermarket and restaurant menus stuck in your front door if you take the action to post this sign below. Advertisers know the power of the default option. While I expect most people would prefer not to get the ads, it takes effort to get the laminated sign and tie it to your front gate. On any single day, it is easier to just throw the circular away. If the city council had managed to pass a law in which homeowners had to opt in, the whole industry of dropping off ads would have been dead the next week. Would anyone have taken the trouble to say, "Please do place unsolicited advertising on this property?" The difference between opt-in and opt-out can determine the fate of an industry. What's the deal with the Jeffrey Modell Foundation? Advertisements about Primary Immunodeficiency by the Jeffrey Modell Foundation are all over the airports these days. While traveling over the past couple months, I've seen at least a dozen different ads: here are a few samples. From the hardship of their own experience, Jeffrey's family learned the enormous medical, emotional, and financial difficulties associated with Primary Immunodeficiency (PI). They found that families with this problem had nowhere to turn for help. Since Jeffrey's death from pneumonia in 1986, the Modells have been committed to supporting those afflicted with PI. They established the Jeffrey Modell Foundation to help patients, their families, physicians and researchers understand the nature of PI. While the Modells may be committed to supporting those afflicted with PI, it seems they are also committed to supporting a fairly comfortable lifestyle for themselves. The Form 990 below gives the latest available financials on the foundation. In 2009, it had total contributions of $8.4 million. Out of this, Frederick Modell, the President of the Foundation, had reportable W-2 comp of $352,962, and other estimated comp of $291,654. Vicki Modell, the Vice President and Secretary, had reportable W-2 comp of $255,769, and other estimated comp of $276,276. So out of contributions of just over $8 million, the two founders took home comp of about $1.1 million. The Form 990 doesn't give the details on where the Foundation gets its donations, beyond the breakdown that $3 million came from government grants and $5.4 million came from all other contributions. Why would the government need to funnel money through a Foundation that uses such a high percentage of funding for the personal comp of its two officers? Who is providing the other $5.4 million in funding? I'm curious if a pharma company with a treatment for PI is providing that funding so the foundation can raise awareness of the condition. When a pharma company advertises a condition that we didn't previously recognize existed, it seems obviously self-serving. While if a foundation raises awareness, it seems public spirited. Not sure if this is what is going on here, but it does seem to me highly unusual to start a foundation devoted to the disease that killed your son, and then to take home comp of over $1 million a year from that foundation. Dog food at the airport? When I first saw this ad from forty feet away, I thought it was promoting a new service at the airport where you could buy pet food for your dog while in route. "Well, you can buy diapers in the Nanny Caddy, and you can buy an iPod Touch in the Best Buy vending machine, so this doesn't surprise me," I thought. Then, when I got closer, I realized it was promoting the food court. Is it possible that Au Bon Pain signed off on this? Could there be any clearer message that airport food is equivalent to dog food? 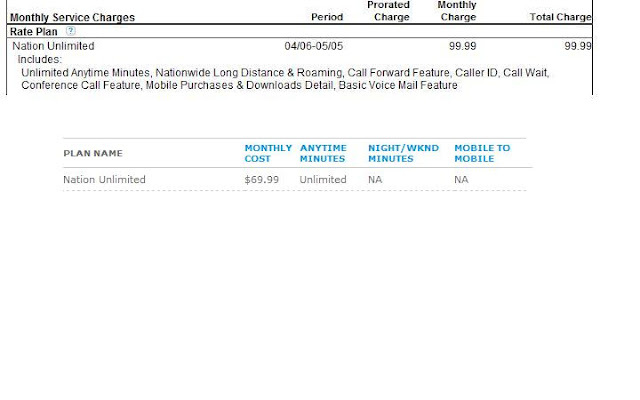 If you are on the Nation Unlimited plan with iPhone on AT&T, check your bill. They've been charging me $99.99 per month for that plan, and when I compared it to my wife's recently, I discovered that she has the same exact plan for $69.99 per month. They lowered the price on my plan well over a year ago and never bothered to ask me if I'd like to pay less. Serves me right, I guess, for not checking the bill more carefully. When I called up AT&T, at first they offered to backdate the $69 rate to the beginning of my current billing period. Then when I asked to speak to a supervisor, they told me that they would go back three months, but that was as far as they were legally allowed to do. Then I said, OK, fine, just please give me your names, because I want to write to the FCC and my Congressman and the Better Business Bureau and the Chairman and CEO of AT&T because it doesn't seem like a very good business practice, and perhaps even illegal price discrimination, to charge different people different rates for exactly the same plan. After another 5 minutes on hold they agreed to backdate the $69 plan for a full year, for a $360 credit. Not bad for 20 minutes on the phone. Why shouldn't the Surgeon General insist on a health warning to be broadcast before every television show? So television is responsible for more deaths than all illegal drugs. But the media industry has better lobbyists. Every hour spent watching television each day increases the risk of dying from heart disease by almost a fifth, say scientists. So 11% is almost 20%? Please excuse me while I step away from the computer to take a walk. An article in the April 26 edition of the WSJ, "Out Front in the Fight on Fat" profiles the efforts in Portland, Maine to fight obesity by promoting 5-2-1-0 principles (5 servings of fruits or vegetables, 2 hours or less of screen time, 1 hour of exercise, and zero sugary drinks.) After spending $4 million, the obesity rate dropped only 1.4%. It took grit and determination for 17-year-old Sean Speckin to lose 80 pounds last year, after a doctor warned him he had high blood pressure and might have to go on medication. "I was angry," says Sean, who was 5'10" and 260 pounds. "Pretty much all I did was eat junk food" and watch TV, he says. He and his father, with whom he lives most of the time, would often eat burgers or pizza. Acting on his own, he ditched burgers and fries in favor of chicken, vegetables and fruit. He asked Dr. Rogers, whose son is a good friend, for advice. She suggested granola bars and yogurt instead of cookies, and walking. A doctor suggested granola bars and yogurt?? 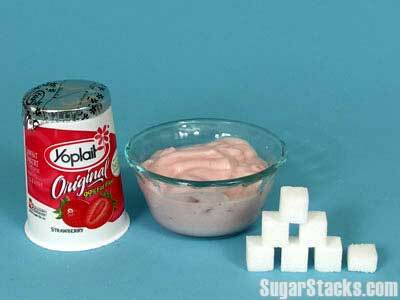 The majority of the calories in both comes from sugar. 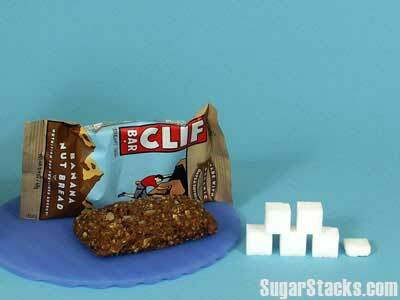 Images from www.sugarsnacks.com. One of the best papers I've ever read on the problem solving process that consultants use is a McKinsey Staff Paper (Number 66). When I was at the Firm, I read it a dozen times. This paper is available for download here at Scribd.com. Just found this site - I suppose it is well known to millions. They have three thousand (and counting) vintage children's books available to read online, as scans of the original, with all the gorgeous illustrations. Check out what kids were reading in the 19th century at archive.org.